Vergeletto 25 km from Locarno: Cosy, rustic, simple small apartment house "Strecce", 3 storeys, semi-detached, renovated. 2 apartments in the property. In the resort, in a quiet, elevated position, 25 km from the lake. Private: property, garden (not fenced). Heating to be paid on the spot. Narrow motor access to 50 m from the house. Stepped path (60 steps) to the house. Public parking 50 m on the road. Grocery 50 m, shopping centre 25 km, restaurant 100 m, bus stop "Vergeletto" 50 m, shingle beach "Fluss / Fiume RIBO" 500 m, indoor swimming pool 25 km, public bathing area 25 km. Riding stable 2 km, walking paths from the house 5 m, cable car 2 km, cross country ski track 2 km, ice field 2 km. Well-known lakes can easily be reached: Lago Maggiore 25 km. Hiking paths: Valle Vergeletto. Please note: There are more similar properties for rent in this same residence. "this property", 4-room apartment on 2 levels, on the upper ground floor. Practical and cosy furnishings: living room with open-hearth fireplace, satellite TV and flat screen. Large kitchen-/living room (oven, 4 ceramic glass hob hotplates, electric coffee machine) with open-hearth fireplace. Exit to the terrace. Sep. WC. Electric heating. Upper floor: 1 double bedroom with 1 french bed (1 x 160 cm, length 200 cm). Exit to the balcony. 1 room with 1 double bed (2 x 90 cm, length 200 cm). 1 room, window onto the courtyard with 1 bed (90 cm, length 200 cm). Shower/bidet/WC. Wooden floors. Balcony, terrace. 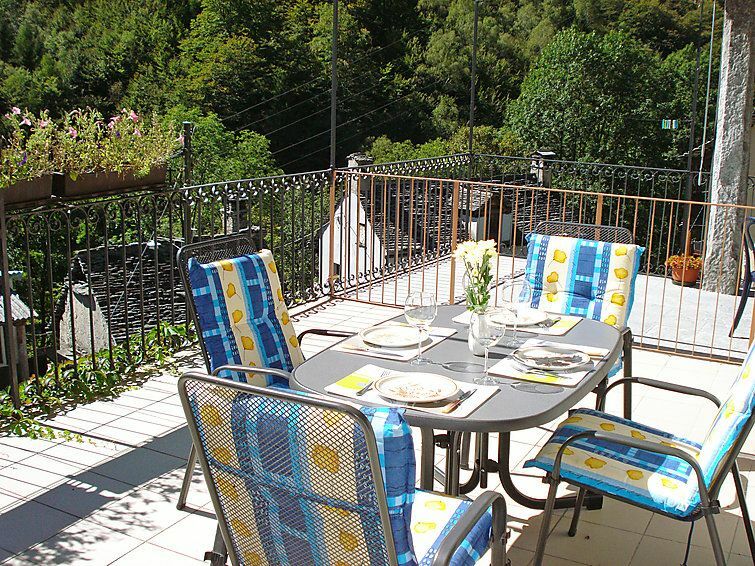 Terrace furniture, deck chairs (2). Partial view of the mountains. Facilities: washing machine, dryer. Please note: non-smokers only.